We’ve cut the cord! Now Dancing with Duplex is even easier with our new arrival. The Duplex 380B Turbo has been developed from the remarkably successful Duplex range of floor cleaning machines. When our development engineers were asked to design a battery powered 380mm wide unit they were given one brief: make sure it has the same cleaning capability as the rest of the range but with at least one added innovation. Well they came up with a winner! From wall to wall and into the tightest corners the Duplex 380B Turbo is ideal for daily maintenance or deep cleaning. 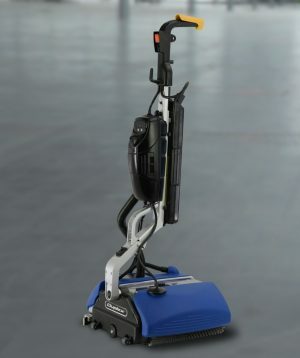 Whilst our Duplex steam machines are unique in the market, the 380B is also unique in its own right; there is nothing else on the market that is battery operated, sweeps and scrubs all hard floors, dries with two different systems and cleans and dries carpets. The 380B not only benefits from the mechanical pick up utilised by the existing Duplex machines it also incorporates an eco-friendly vacuum. On hard floors the combination of twin brush mechanical pick-up, vacuum and twin squeegees ensures that surfaces are left perfectly dry. The squeegee can be easily lifted and the vacuum turned off when cleaning carpets. So not only one innovation but three.